Do you remember what it feels like to get your bike out for the first time every year? That first ride brings back the taste of freedom and the feel of the open road. That's exactly the time when you need quality motorcycle boots to wear for maximum comfort and saf ... (see full details) (see specifications) #CHP27862. Do you remember what it feels like to get your bike out for the first time every year? That first ride brings back the taste of freedom and the feel of the open road. That's exactly the time when you need quality motorcycle boots to wear for maximum comfort and safety. 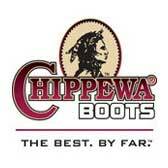 Chippewa understands that riding is one of life's simple pleasures, and in keeping with that understanding, designed the Chippewa Men's 27862 Black USA-Made Motorcycle Rally Boots as the premium riding boots for biking enthusiasts everywhere. Designed with you in mind, this premium footwear has a design that includes advanced Velcro closures running up the side of this leg protecting 12-inch black shoes. The Velcro design ensures a great fit to the contour of your body, and also makes these classic men's boots really easy to pull on and take off. After a hard day's ride, nothing's better than not struggling to take off your motorcycle boots. From a technical riding perspective, the leather boots boast reinforced kick pads, as well as reinforcement areas on top of the men's boots to bolster the ease of use at the shifter strike area. To minimize irritating vibration and skin irritation, advanced Maple Calf leather lining has been carefully engineered into these rally boots, giving you years and years of comfortable use and safety. Black odessa leather makes up the tall uppers of the American-made shoes. For extra support, triple-ribbed steel shanks help give your arches that added reinforcement they need. Vibram nitrile yellow plug outsoles create durable bottoms to the Chippewa footwear, and these are attached to the leather uppers using Goodyear leather Welt construction. The midsoles feature a 4 iron rubber/6 iron robus combination for the ultimate comfort and support. With the motorcyle boots, Texon insoles help keep your feet cozy during all your adventurous rides down the highways. Ride proud, ride hard, and ride safe with the Chippewa Men's Black 27862 Motorcycle Leather USA-Made Boots. Order yours today from Working Person's Store! I wore these boots for two years. The quality and materials are top notch needless to say. The one complaint that I had with these boots that appeared early on was that the two small straps down along the ankle area are velcro. In a very short time the velcro simply stopped gripping, resulting in those straps just dangling loose. Finally I had to resort to taking them to a boot shop to have snaps installed to keep them closed. Snaps would be a far better idea for this type of strap in this location. The upper velcro for the main body of the boot worked great, never had a problem with that. 50 out of 71 people found this product review helpful. I bought these boots seven years ago and i'm still wearing them today . They are the most comfortable boot and after a long ride so easy to take off. I ride with them in the rain and they keep me dry would recommend oiling or waterproofing them from time to time. The workmanship and quality is EXCELLENT...!!!!!! I/ve worn these boots over 2 years. They are the best for riding but walking very far is uncomfortable. My feet tend to slide forward. I wear cowboy boots the rest of the time when I'm not riding. Order your typical size. Just received my boots yesterday and can only share with you my first impression about the craftsman of this boots. Good quality over all the leather is thick but soft and won't need breaking time to feel comfortable. Sizing : I wear size 9 in all my boots and had to add a shoe insert on this ones to feel right and cozy. in general the boots look well made and hopefully will last . I don't know about the longevity of the velcro closing system with time. but will find out soon or later. my only down side is the heel hight a bit to much for my test. so a adjustment will have to be made. Chippewa Boots: Men's Chippewa Black 27862 USA-Made Leather Rally Motorcycle Boots is being added to your cart.